North Korea has confirmed that it has test-fired a series of missiles and said it would continue launching them. It also warned of "stronger physical actions" if the international community tried to put pressure on Pyongyang. The North launched seven missiles, one of which was a failed test of a long-range Taepodong-2, believed to be capable of hitting Alaska. The UN Security Council resumed debate on Thursday on a draft resolution in response to the launches. The document, co-sponsored by the US, UK and Japan, calls for sanctions against North Korea, but differences in approach are already emerging among key powers. Japan is reportedly pushing for economic sanctions while China and Russia - sympathetic to the North - oppose any punitive measures. But Russian President Vladimir Putin said the test launches were "disappointing", and stressed the need to resume diplomatic talks. Speaking on a webcast for the BBC, and Russian website Yandex.com, Mr Putin said concern over the tests "should not drown out common sense". He added that it was "practically impossible" for the North to build a missile capable of striking targets 6,000km (3,700 miles) away, with its current level of technology. US envoy Christopher Hill is travelling to the region to discuss the next steps, and a senior Chinese negotiator is heading to Pyongyang next week aiming to kick-start negotiations. In a statement reported by South Korean media, the North made its first public acknowledgement on Thursday that it had recently test-fired missiles. 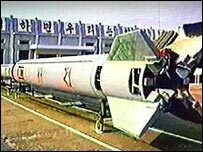 It described the tests as successful - even though the long-range Taepodong-2 failed shortly after take-off. The missiles all landed in the Sea of Japan. The launches were part of "regular military drills to strengthen self-defence", the North's foreign ministry said in a statement carried by the state-run Korean Central News Agency. "Our military will continue with missile launch drills in the future," it added, insisting such action was "our legal right". South Korean media reported on Thursday that there were three or four more missiles waiting on North Korean launch pads, although they were not thought to be long-range. US President George W Bush has stressed the US's commitment to six-party talks and the need for the international community to "speak with one voice". The message to Kim Jong-il should be: "There is a better way forward for you than isolating yourself," he said. He said the US took the North Korean's leader's statements "very seriously" and did not know what North Korea's intentions were. "We need to plan for the worst and hope for the best," he said. He has already spoken to Japanese Prime Minister Junichiro Koizumi and South Korean President Roh Moo-hyun in an effort to reach a consensus. There are, however, obvious differences between the parties involved. Tokyo - one of North Korea's harshest critics, and in easy reach of its missiles - has led regional condemnation of the launches and supports sanctions. But South Korean officials have only agreed to co-operate in diplomacy, with Unification Minister Lee Jong-seok calling for "patient dialogue". North Korea's closest allies China and Russia are also extremely unlikely to back sanctions. The last time North Korea tested a long-range missile was in 1998, when it launched a Taepodong-1 over northern Japan.